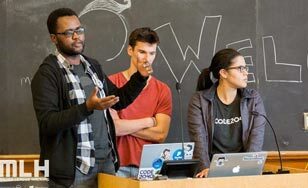 Malvern Madondo presenting at CarlHacks 2017 along with CSS students Alex Afanasiev and Daniela Moreno Gomez. 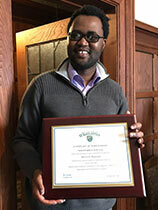 When Malvern Madondo arrived at The College of St. Scholastica as a first-year international student in 2015, he had no idea what to expect. Having grown up in Zimbabwe, he had never visited Minnesota or stepped foot on campus before the day he arrived to start his college career. "A lot of things were different," he said. "The food tasted different; driving on the right side of the road was different; the weather was a shock, and I quickly learned that people interacted with each other differently than in my country." But, despite the culture shock, he said he loved St. Scholastica immediately. Now in his junior year double-majoring in math and computer science, he is leaving no opportunity unturned. "In my Zimbabwean community, people value deep, lasting relationships," he said. "When they meet you, they try to really get to know you and find things they have in common with you." Malvern has taken that gift of relationship-building from his culture and applied it academically, professionally and socially. His long list of extra-curricular achievements is evidence of that. "I have found that college is really what you make of it and a big part of that is developing relationships," he said. 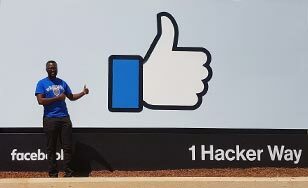 Last year, Malvern was honored to be chosen for a summer internship at Facebook headquarters in Silicon Valley. While there, he learned about developing mobile iOS software applications and experienced what it’s like to work for a major tech company. "Facebook has a unique culture," he said. 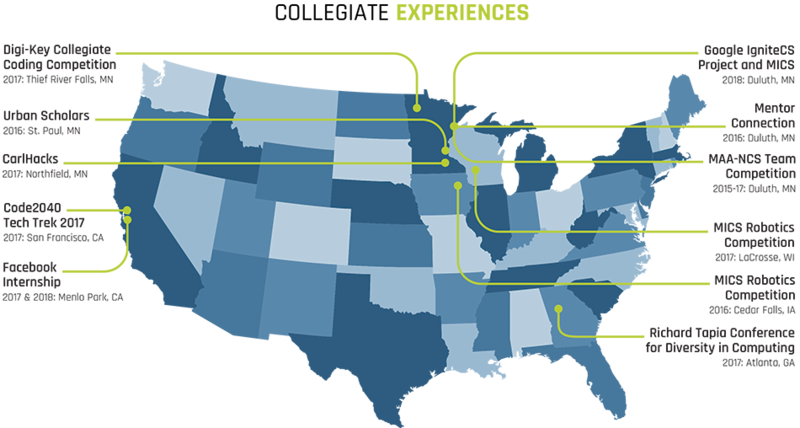 "There are so many intelligent, talented people there and everyone is friendly and willing to share their expertise — even with a first-year intern like me." 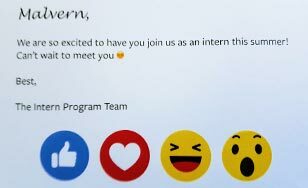 Malvern has accepted an offer from Facebook to return this summer for a second internship. This one, he said, will be more rigorous, and he’s looking forward to the challenge. Malvern was also recently selected for a Phillips Scholarship — a competitive scholarship for students who display academic achievement, a commitment to serving others, a strong work ethic, and leadership qualities. As part of the application requirements, he designed an after-school program to introduce middle school students to computer science and programming basics. 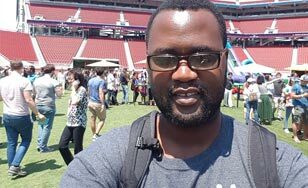 Unfortunately, he had to decline the scholarship because it conflicted with his internship at Facebook, but true to his character, he decided to implement the after-school program anyway as a Google IgniteCS program. Now, he and some other St. Scholastica students he recruited are facilitating the 6-week program at Lincoln Middle School in Duluth. "St. Scholastica has been a great place for me," said Malvern. "I have so many mentors who have challenged me and helped me find new opportunities, especially Computer Information Systems (CIS) professors Tom Gibbons, Ph.D., Kris Glesener, M.S. and Jen Rosato, M.A. I have benefited from programs such as Mentor Connection and from the support of my host family and other international students at CSS. They encouraged me to pursue internships, supported my independent studies and encouraged me to take part in conferences and competitions." Malvern says he sees computers as a means by which peoples’ lives may be improved, and that’s what motivates him the most. He hopes to use the knowledge he’s gained to help others, possibly by designing educational software for people with special needs or in underserved countries. While Malvern is uncertain about what path he may take after graduation, he hopes to be in a position and place where he can make a positive impact, and contribute to Zimbabwe’s technology sector and beyond. The winner of the St. Scholastica 2017-18 Student Employee of the Year award is junior Malvern Madondo, who works as a web assistant in the marketing department. Web Specialist/Front-End Developer Lori Luing nominated Madondo for the award. "Malvern's leadership style is a combination between participative and transformational," said Luing. "His ability to think critically and lead projects from start to finish enhances the capabilities of the web team at CSS."